High Energy Diet, Foods For Long Term Success! No weightloss program can work long term without high energy diet foods. Fad diet types and extreme low calorie diets leave us tired and feeling low. The body assumes that it is starving and not only lowers the basal metabolic rate (the rate at which your body burns calories) but also begins to burn muscle tissue as well as fat for energy. The body loses fat, muscle and water. This so-called weight loss will be regained as soon as we return to the old eating habits. The fat reappears but not the muscle tissue, compounding the situation yet again. These diets are unhealthy and aging for a number of reasons and we should avoid them at all costs. To get fit, lose weight and reclaim energy on the Back To Fitness Challenge we need to exercise and make food an ally not an enemy. A high energy diet should consist of foods that release the energy slowly into our system. These foods keep us full for longer avoiding the energy peaks and troughs of simple carbs like white bread and sweet snacks. What is the GI Index? The Glycemic Index (GI) is a method of indicating on a scale of 1 – 100 the effect a food has on our blood sugar levels. 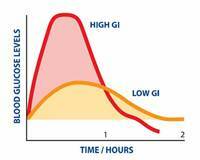 Low GI foods raise the blood sugar levels slowly to an acceptable level. The high GI foods raise blood sugar levels rapidly to an unhealthy (high) level which is then followed by a rapid decrease. We experience this fall in blood sugar levels as tiredness and lack of energy. The GI index lists all foods into 3 categories low, medium and high glycemic levels. Eating low GI foods can help us enormously in achieving and maintaining our preferred weight and avoiding heart disease, diabetes, gout and more. At Wikipedia Glycemic Index you will find a simple to understand but more detailed explanation of this concept. Alternatively an inexpensive pocket guide is useful. 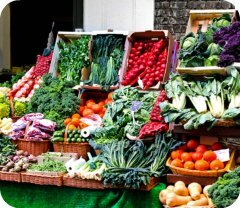 Low GI foods (under 55) include: Almost all fresh vegetables, fresh fruits, nuts, seeds, lean meat and poultry, wholegrain rice, quinoa, Whole grain bread and much more. Medium GI foods (56 – 69) tinned fruits and dried fruits, carrots, kurbis, corn, honey, most juices, popcorn, fruit yoghurt and ketchup and mustard. High GI foods (70 or more) White bread, croissants, begels, processed cereals, crisps, fries, dates, chocolate, waffles biscuits etc. A lot of this is common sense but there are also some surprises. You will find learning about how food effects our energy levels can be a tremendous advantage on the fitness walking program . Knowing what to eat to provide us with enough energy to stay with the Fitness Training Plan and get fit again. But that’s not all.. a high energy diet of predominantly low GI foods also reflects in our health, especially important for mature women. Low GI foods are fat burners. Blood sugar stays regular, no highs and lows. Assists brain function, avoids foggy moments. Helps protect against heart disease. Help protect against heart attack, stroke and alzheimers. Eat smart move more is our motto! Why not join us on The Free Back To Fitness Challenge at Anti Aging in Action on Facebook. I invite you to download these 2 FREE fitness charts NOW to motivate you and measure the success of your exercise challenge and high energy diet combination! Breakfast Smoothie Recipe for More Energy! Healthy Breakfast Foods – Get Off To a Good Start!